Sweet Winnie the pooh night light. Condition is Used. Dispatched with Royal Mail 2nd Class. Plays lullaby’s and changes light colour. 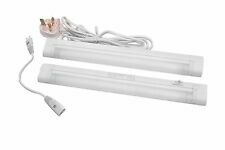 2 x Under Unit / Cabinet Light ---Takes 1 x 8W G5 T5 300mm Fluorescent Tube 3500K (included) ---Each Light has it's own individual on/off Switch ---Diffuser Covers ---Complete with 2 metres mains lead, 2 X 15CM link leads and butting connector ---Fittings 300mm 8 watt Fluorescent T5 ---Up to 6 in Total Can be Linked Together --- --- These lights can be butted together in a straight line or connected with the link leads. Dimensions: 34cm long x 2cm wide x 4.5cm deep. Ideal for In Closets, Storage Rooms, Kitchen Cabinets, Bedside Light, Attics, Crawl Spaces, Tool Boxes, Sheds, Cars, Boats, Caravans, Trucks, Hiking, Camping and so on endless use. Enjoy Bright light wherever you need it fast and easy without tools.These compact LED lights Install in Seconds anywhere you need light. 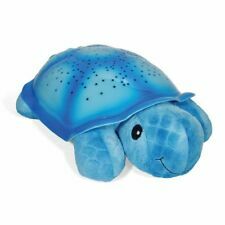 For use as a soothing, cuddly nightlight, the Twilight Turtle Blue lights up at the push of a button! Twilight Turtle Blue. Twilight turtle Blue is a great way to get your children to sleep! On the face of it, the Twilight Turtle is a comforting, soft toy. This modern Auto-changing soothing colours LED light with choice of 16 illumination colours. 45degree upward light source design ensure the widest illuminous range. Great for using in any bedroom, living room, office and even parties. Disney Pixar Toy story go glow night light and torch in good working condition. Light up your little one's room with the friendly, comforting glow and sounds of Big Red Rocket! Automatically shuts off after approx 15-20 mins depending on the mode selected. Easily mounts to the wall. Just flick the switch on its base and the rocket will illuminate red before phasing through a range of other colours, including green and blue. It goes great in any room and can be used as a brilliant alternative night light. KW1-KW17, PA20-PA38, PA41-PA49, PA60-PA78, PH4-PH44, PH49-PH50, PO (Isle Of Wight) TR (Isles Of Scilly) ZE (Channel Isles). Easy Stick With Self Adhesive Pad. LED Push Button Lights. 3 LED Lights. Push On / Off. Ideal For Under Shelf Lighting, Lofts, Sheds, & Cupboards. KW1-KW17, PA20-PA38, PA41-PA49, PA60-PA78, PH4-PH44, PH49-PH50, PO (Isle Of Wight) TR (Isles Of Scilly) ZE (Channel Isles). LED Push Button Lights. Hello Kitty Mood Lamp Colour Changing Night Light. Condition is very good.No original box but will be boxed for posting. Black marks on pics are from camera...no marks on lamp. Batteries included. Dispatched with Royal Mail 2nd Class. This 3D Peppa Pig Colour Changing Light magically brings your favourite little pig to life! Cool to touch, with an easy on / off switch, this is a definite must have for any Peppa Pig fan. A great gift for Peppa fans. PERFECT FOR ANY FROZEN FAN! WILL HELP YOUR CHILD FALL ASLEEP - EVERY NIGHT OF THE WEEK. SIMPLY SELECT YOUR CHILD'S FAVOURITE STORY AND WATCH THE. COLOURFUL LIGHT SHOW. 5 BOOKS INCLUDED;. This portly little critter will look brilliant standing proudly on a bedside table or living room shelf. - Contains 1 x Dinosaur Mood Light. - Warning: this is not a toy. Colourful starry night projection with a sense of rhythm to the music to softly lull your baby/child to sleep. Function of countdown to display starry night projection (timing from 00: 01 to : 00-59). PLANET NIGHT LIGHT. WEDDING PARTY BANNERS. Price: £8.95. FLAMINGO WATERING CAN 1.5 LITRES. Quick view. Price: £4.95. JUMBO STORAGE WORLD MAP RECYCLED REUSABLE LAUNDRY BAG. Price: £9.95. An unassuming plug in, the Wall Washer is anything but when switched on, as once it senses darkness, this LED light bursts with colour projecting a striking pattern of colourful light into your room. Brighten up the room with our cute Honey the Hedgehog party lights, fitted with a BS standard plug. WEDDING PARTY BANNERS. Distance from plug to 1st bulb: 1.5M (Approx). Length of Chain: 3.3M (Approx). This cute LED Rocket by ' Light Up' would be perfect for any budding astronauts bedroom. It can be either wall mounted or free standing, it gives off a soft warm light, perfect for a night light in a bedroom or nursery. Paw Patrol night lamp SKYE with glitter. Many different colors in one lamp. Beautiful model of night lamp with SKYE from series Paw Patrol. Many colors in one lamp -changing automatically. High Quality and safe for children, changing colors of light. Cloud B Tranquil Turtle Night Light. Good used condition. Velcro on bottom not overly sticky anymore. Dispatched with Royal Mail 2nd Class. These cute Dinosaurs has a soothing LED light which will create a comforting light in a child's bedroom. Long-lasting LED with Low power consumption. Projects a brightly coloured lightshow on walls and ceilings to relax and lull your baby to sleep. Requires four AA batteries (not included) and suitable for use from birth. Brightly coloured lightshow designed to relax and lull babies to sleep. A cool PJ Masks Catboy 3D Colour Changing Light is a must have for little for PJ Masks fans magically bringing your favourite character to life.